When I write an article for a publication, I start by jotting my ideas down on paper. Then I read them, I think, I try to organize them. I structure, I restructure, I cut, I develop. Finally, I polish the style. For my blog, I stop at the first stage of notes organized more or less randomly, because this is not a review. As usual. Thrilling moment: the show begins. Will it please me? Will the creators meet the spectators expectations? A man is lying on the stage as the spectators walk in. I thought it was a great, disarticulated puppet. But when he gets up, we see that he is a real man, just a bit gray in his face. He stares at the spectators as they take their place. He removes his standard gray suit, then his underwear. A naked man, what a beautiful object. How fragile. He turns over one of the rubber plates that cover the gray scene: it is white on the other side. He lays down on it. A naked man is even more fragile. A bearded man arrives, also dressed in a standard grey suit. He lays a cloth on the naked man. Until then, I have been seduced, but I do not like much the fabric nor the way that the man drapes it over the naked man, it’s too self conscious. The bearded man leaves the stage, another arrives also dressed in a standard suit. He lifts a rubber plate and drops it. The draft lifts the tissue and moves it off the body. The man is naked again. This action recurs at least a dozen times, the men’s actions closer and closer together until they are on stage simultaneously. I do not understand the meaning of this scene. At least not immediately. If I reflect, I put together that the man is submitted without recourse to the other two men’s actions. Either he's cold when the sheet is off, or he’s hot when he's covered, but the two men do not seem to care about his welfare. Soon there are six men on stage, two women. Yes, I take a count. For many male creators, a human is a man. Women work as an accessory that define man as clothing or decor. But when a woman emerges from a astronaut costume, against all odds, I review my hasty judgment. He now has six men and three women. It's better, but we could have six women and four men, for example, though they would not wear the standard suit in the same way. They are either in long black dresses, or in alluring lingerie. Music: the famous waltz, slowed down at least 10 fold, by Johannes Strauss. An astronaut appears on the scene. Hello, 2001 A Space Odyssey, by Kubrick! The show explores humans as individuals, their consciousness. A theme that I like very much. In fact Numen and I were discussing it just recently, blog entry to come soon. I argued that humans have a consciousness of themselves, and offered as a metaphor a novel. While it is made of words on paper, the novel still exists if one burns the paper. He argued back, what about a severed hand still alive and kicking, something science might achieve soon? Is it human? Dimitris Papaioannou seems to want to answer these questions. A woman appears advancing on legs that too big, like a spider’a. The illusion is created by two men bent over who walk backwards while she rests on their bodies. One leg is naked, the other is black and disappears against the black background. During the show, members appear thus, detached and then regrouping to form a human being. Witchcraft. The magic of the theater, Deus ex machina, Robert Lepage would approve. 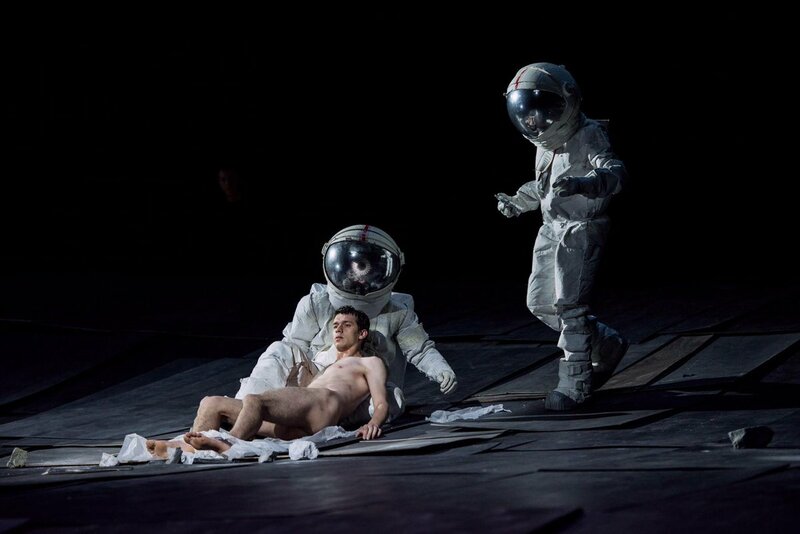 Papaioannou began his career by making comic books, and he certainly has an exceptional control of gestural language. The staging of the bodies and their movements across the stage shows great skill, great talent. A man puts on shoes that seem to lie on the stage. When he picks them up, they turn out to have roots. He walks on his hands, his feet waving their roots in the air. A memorable image. Pina Bausch. Is it in the tradition of gestural theater? Dance-theater? It's more delicious without putting a label on it. The same position of an actor / dancer / acrobat evokes something else depending on the sequence in which it appears in the room. For example, an actor in a swimmer position between the legs of another actor reminds me of a boat prow. Later, this same position evokes a man floating in a state of weightlessness. Similarly, arrows are thrown on the naked man who is protected by some rubber plates, these same arrows become ears of corn that the actors glean tenderly in a beautiful scene. Visuals reference Botticelli’s Venus, Michelangelo’s David, the Lesson of Dissection by Rembrandt. I sometimes have the painful impression that as European creators, we have so little to say in comparison with Africans, Asians, South Americans, that we are left with digging up references in our cultural past. The actors undress and get dressed a lot. A LOT. Fortunately their jackets are not double breasted, nor their trousers with buttonholes. At points, it felt like the creator wondered, what else could we do now? Some of the tricks he came up with, ingenious, should have been gotten rid of, because they did not contribute to the integrity of the show. As Steven King advised, the creator must be able to kill his little darlings. Sometimes, if I do not understand an action or an effect, I give them the benefit of the doubt. At other times, no, it does not convince me at all. during performances I relish, I look forward to the end, from being a prisoner of the spectator-creator relationship: what if I do not like the show? Help! What if an actor forgets his role and begins to cry on stage? What if I love it, and all the other spectators boo and whistle and all the actors begin to cry? The end comes as a relief. I do better during very long shows which I have a preference for. Either very long or very short. That longing embarrasses me, as if I forced myself to go to the theater, as if I preferred to drink a glass of wine while varnishing my toenails.